This morning I made eggs in potato nests for breakfast. Xander watched me crack the eggs and throw the shells into the sink. When I came back to clean up the sink, he had added his own plastic egg. I guess he figured that's where they go. The rest of the day he kept trying to throw his eggs into the sink, which is quite a feat for him since he can barely reach the edge of the counter. Just a reminder that I need to be careful what I let him see me do! No climbing on chairs to reach things in front of him! Since we have completed all of our individual Color Themes, I decided to devote a week to black and white. We started with a bin of black and white objects. It included some toy zebras, penguins, and a cow. It also had black and white wooden balls and some ping pong balls. I threw in some of the pieces from his Space Toob. Also, his bean bags made a perfect addition. However, this was probably the bin he has played with least of all of them we have done during our color themes. He did enjoy throwing the bean bags back into the bin, as well as balancing them on his head. We used black markers with a white background on his Crayola Dry Erase Activity Center, as well as colored with white crayon on black paper. One of the biggest addition to this week's Tot School time was a set of 3 part cards I made him of black and white things. I have read a lot about Montessori 3 Part Cards, but we have never actually used any. 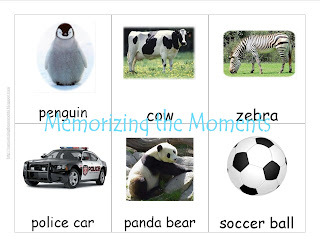 Because he is so young, we do cannot really use them in the normal fashion, but I thought it might be good for vocabulary building and word recognition. I am so glad we tried it, because Xander absolutely LOVED them. I set him in my lap, showed him each card, and put it in our pocket chart. He immediately wanted to do it again, and then enjoyed pointing to the picture of the word I said. (For cow he would point and "moo" every time, it was adorable). I was impressed at how well he did. He could point to them all consistently, except for penguin. What also surprised me was how often he would go pull out the pocket chart and complain to me until I set it up to go through the cards with him, sometimes wanting to do them two or three times a day. 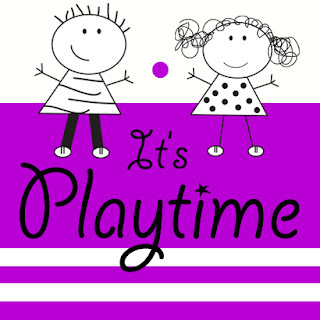 If you think your little one would enjoy this activity, you can download our Black and White 3 Part Cards here, or from my Colors Page. Of course, we also did some of our regular Tot School activities. We read a ton of books, watched our Your Child Can Read DVDs, and did our Little Reader and Little Math. I also decided we needed to get back to working on perfect pitch. Xander still gets exposure through his Your Baby Can Discover DVDs and Trebellina, but we haven't been working on the actual piano lately. This week we decided to get back into the swing of things. I showed him the flash cards that we got with Trebellina and then I used his finger to touch the corresponding note. He enjoyed the activity so much, wanting to go through the cards again and again. I was surprised that he liked going through the flash cards much more than just randomly hitting the keys. He liked the activity so much, I was even able to use playing the piano as an incentive to come in from playing outside. Since we are still doing color themes, one of his trays is taken up by the black and white bin. His second tray was his Velcro block. He did much better at putting them on than last time, but much prefers me to put all the discs on so that he can take them off. The next tray was the cow from the Melissa and Doug Lace and Trace Animals Farm. Even though I know he is not ready for lacing on his own yet, I found it super cheap at a consignment sale and decided to try it out. He can't get the lace into the hole by himself, but he likes pulling it through once I line it up. He would periodically grab the cow and bring it to me. Sorry the pictures are a bit awkward, I couldn't let go of the cow. For one of his trays I always try to do a puzzle. He is not actually ready to do puzzles on his own, but loves to do them with me. We will slowly transition into him doing them without help. This week's puzzle was the Melissa and Doug Zoo Mix N' Match Peg Puzzle. He enjoyed having the pegs to hold, and wanted to sit in my lap and do the puzzle together almost every day. These are our finds from week 12. You never can tell which books will captivate Xander. This week, it was this book. Each page has a picture of the whole vegetable, and then there is a flap to lift that shows the insides or slides. He also really liked being asked to point to the vegetables. This book goes through some of the lesser known animal group names, like a skulk of foxes and a bevy of quail. There were some really cute pictures to go with the names. I ended up learning a lot. Back in January I stared out 1500 Book Challenge, and am excited to give an update! We are officially a quarter of the way to 1500 unique books! Wednesday we hit our 375 mark. I have to say, it really has been a challenge. Not actually reading the books, but sourcing them. I end up at the library twice a week and have to remember what have already brought home. Anyway, I am super excited. I would like to do something as a celebration of completing the challenge. I know I have a long time, but am starting to think about it. Originally, I was thinking of taking him to an indoor water park. However, now that he has the tubes in his ears, that doesn't seem like the greatest idea. I doubt they will be out by the time we finish the challenge. I suppose I could get some big toy I wouldn't normally purchase (like the big set of Magna Tiles that I want but can't see paying for). Does anyone have any other ideas? As I mentioned in my last post, last week was my spring break. It was fantastic to get so much time with my little guy. We ended up spending a TON of time outdoors. He could spend hours just walking around the yard touching things and exploring. Here are some pictures of our time in the yard. We have been working on catching and kicking. Some days he does a great job, others he struggles. I am not too worried about it, he is only 16.5 months. I am just glad he tries. He got this castle slide for Christmas and the weather was finally nice enough to take it outdoors. One day he decided it was fun to throw the ball up the slide and catch it as it rolled down. One of Xander's favorite book series is the Preschool Prep Sight Words books. One of the books is called "The Leaves." While we have read this book over and over again this winter, I don't think he really understood what leaves were. He had a great time discovering them outside. I am anxious to reread the book now that he has had some experience. I had a chair and a book on the patio to read sometimes while I watched him. He kept insisting on sitting in the chair and "reading" my book. He did this numerous times, for a surprising long time. So I am starting to become addicted to giveaways on blogs. If you're interested, here are a couple I have entered. I will add to this list for any others I enter in the near future. Thanks Mail Carrier is giving away an adorable blanket and stuffed animal from Happy Blankie. They are also giving away an iBounce Trampoline and Step Two Water Table. All of her giveaways are listed on the right sidebar. Living Montessori Now is giving away an iPad2. Mama Goes BAM is giving away a Plasma car. Do you know of any good ones? Have you ever won? Last week was my spring break. We had an absolutely wonderful week spending time together. We also got to go on some fun "field trips" together. First we went to the John Deere Pavillion. They have a great big place with tons of tractors to climb on and explore. Xander had fun exploring it all, from law tractor to giant combine. They even had a kids play area. We were blessed with some amazing weather, so we took a trip to the zoo. I didn't get many good pictures of the animals (we have been there many times before, and will no doubt go frequently this summer), but I did get a cute ones of him. I let him get out of the stroller and walk whenever he wanted. He was so proud of himself to be walking, he was just beaming. My brother was in town, so we took a trip out to a disc golf course that surrounds a lake. It was beautiful, and we had a great time walking around together. Xander loved getting to carry his own disc, although he rarely tried to throw it.